When I was a young sales manager, I attended a training session delivered by a fantastic veteran sales leader, Jim Hackett of the Bunker Hill Consulting Group, now deceased. Among several great lessons he imparted, one that resonated deeply with me was his advice on how to act once I reached the corner office. Jim advised the class that many leaders don't share the same quotas as their sales team. Instead, many leaders set the sales goal higher than their own personal goal or the organization's goal. So, for example, the sales team may carry a $100M target while the organization's goal is $95M. What happens is that leaders place a bit of a cushion between the actual goal and the goal assigned to the sales team, ensuring that even if sales are slightly off the organization will still meet plan, and the leader earns his bonus. As each successive layer of management adds a little cushion, the goal carried by the sales team becomes even more disconnected from the reality of the organization's goals. You can imagine what happens. Sales reaches $97M, or falls short of plan, yet leaders up the chain enjoy increasing rewards for over-achieving plan. Unsurprisingly, salesperson compensation and advancement are adversely impacted. When I heard of this practice I didn't believe it was that widespread. I was supremely naïve. I've since learned that nearly every organization where I've worked does this regularly. The practice is driven by a few factors, in my observation: Many leaders don't trust their teams to submit accurate forecasts, which is of course a reflection on their own ability to attract and retain the right people; many leaders are too disconnected from the customer to truly understand the market forces, and thus they pad their forecasts to cover their own uncertainty; and too many leaders believe the rules are different in the corner office. There may be nothing illegal about such a practice, but my own moral compass finds it reprehensible. However tempting it has been, however much we leaders can justify being rewarded for our hard work and tough decisions despite the organization's performance, I believe ethical leaders should steadfastly refuse to take on a goal that's more achievable than the goal assigned to the troops. During my many years leading sales teams and during my two stints leading organizations, I always carried the exact same revenue goals as my team. I don't know that anyone knew or cared, and I don't believe I should be rewarded for such a "selfless" act. George Bernard Shaw is credited with saying "Ethics is what you do when no one is looking." Imagine the hubris of taking these actions even while everyone is looking. This lesson can apply in other ways as well. Stefan Stern, the Financial Times management columnist, whose writing I enjoy and with whom I had the pleasure to share a podium recently, shares an observation that even stalwart pro-market fans in London are concerned with the optics of paying excessive bonuses to investment bankers while many others visibly suffer. The same challenge exists in the legal marketplace. Should optics or ethics enter into a bonus discussion? As the year winds to a close, some law firm leaders will boast of making tough decisions, then issue a healthy bonus and declare victory over the tough economy, hoping that these actions will send a message of strength and stability to clients and prospective clients. But what message does this send to the many out-of-work lawyers and staff? And will clients really be blind to the reality that profitability for many firms this year is primarily a function of cost-cutting, not brilliant business strategy? Those who have been sidelined by the economic downturn plea for equity and fairness, almost to the point of expecting businesses to embrace socialism. We don't have to discard our business school training and capitalist mindset, however, to understand that sometimes our actions send messages that do not serve the long-term interests of the firm. A clients who observes its supplier throwing employees under the bus may assume that his needs will be treated similarly if they somehow conflict with the executives' (or partners!) needs. Employees, and future employees (yes, hiring will return), will take note of how firms value their employees through their actions, not via their recruiting brochures, and direct their efforts accordingly. 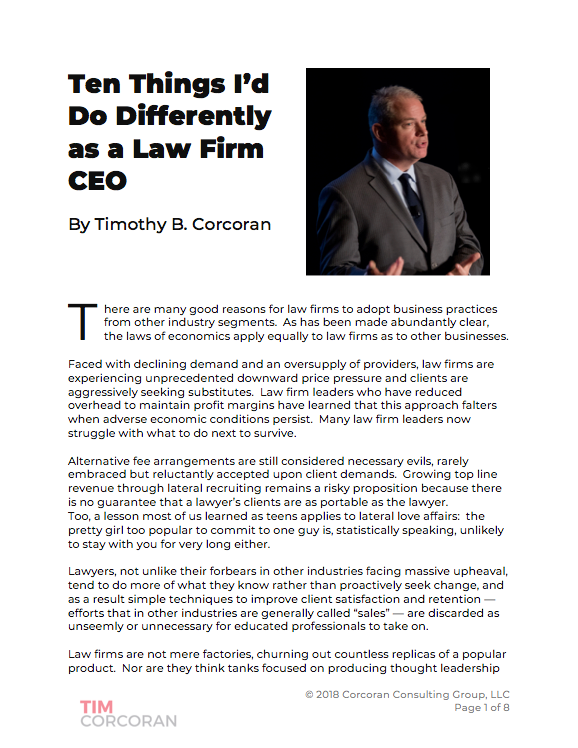 Here's hoping that some combination of ethics, compassion and long-term business interest will inform the decisions that law firm and business leaders will make in the coming months.